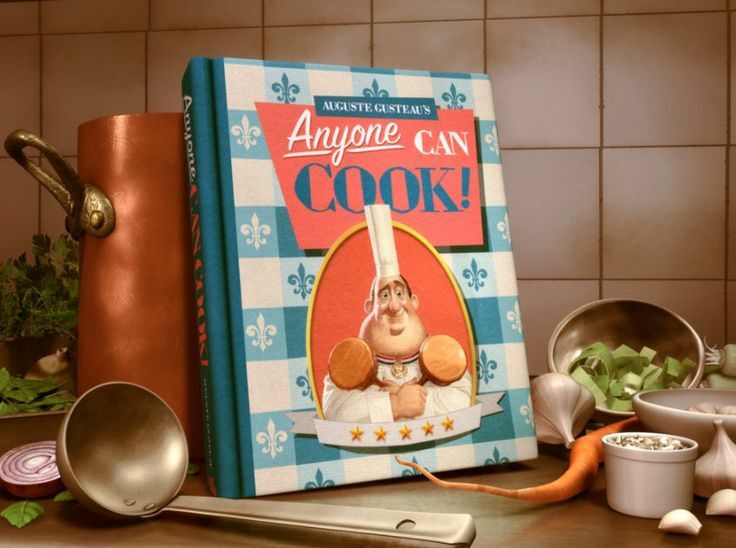 “Anyone can cook!” declared Chef Auguste Gusteau in the classic animated film Ratatouille. We’ll go a step further: with a little cooking know-how and access to a kitchen anyone can do science. Each spring the students of the Science & Food undergraduate course prove us right as they research and experiment their way toward apple pie enlightenment. But you don’t have to be a student in our course to be a savvy kitchen scientist. 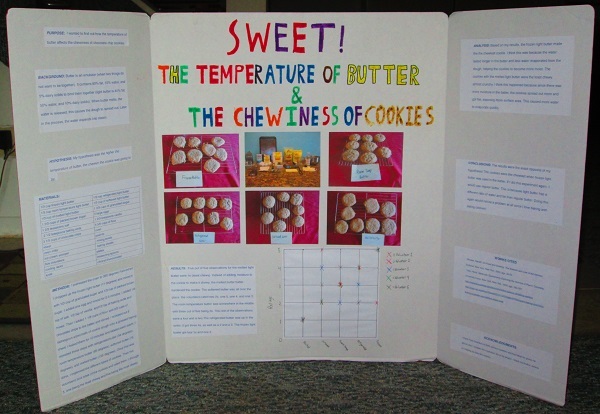 One of our younger readers, Vincent, recently won his local seventh grade science fair by carefully crafting and conducting his own kitchen experiment. By baking cookies with different temperatures of light (reduced fat) butter, Vincent determined that frozen butter creates a chewier cookie than melted butter. His scientifically proven chewy chocolate chip cookie recipe appears at the end of the article. Vincent’s project is a great example of a successful kitchen experiment. For those of you who are avid kitchen experimenters or are thinking of dipping a toe into the world of kitchen science, we’ve summarized the key features of Vincent’s project that will help make any (kitchen) science experiment a success. Vincent’s winning science fair project. A close-up of Vincent’s project. Note the number of cookies baked for each butter condition. A question – Scientific research has to start somewhere, and it almost always starts with a thought-provoking question. Why is the sky blue? Why do apples fall from trees? In this case Vincent wanted to know how the temperature of butter affects the chewiness of chocolate chip cookies. A testable hypothesis – Once researchers have a question in mind, they need to come up with a testable hypothesis. The key word here is testable. Having a testable hypothesis guides researchers as they design effective experimental procedures. Based on a bit of background research and a dash of reasoning, Vincent hypothesized that cookie chewiness would be directly proportional to the temperature of the butter (hotter butter = chewier cookie). Vincent knew he could directly test his hypothesis by baking cookies with different butter temperatures and having a panel of tasters rate the chewiness of each cookie. A carefully controlled experiment – When designing an experiment, it’s crucial to only change one variable, or component, at a time. Vincent was careful to only test one factor—butter temperature—and keep everything else in the experiment constant. A large enough sample size – Once you’ve perfected your experimental design, repeat, repeat, repeat! Mistakes happen. And even the most thoughtfully executed experiments can go haywire because of factors beyond our control. Ovens have hot spots. Humidity can change the moisture of dough. To help avoid these potential pitfalls, Vincent made eight cookies at each butter temperature and had five different taste-testers rate the cookies. Do you experiment in the kitchen? Write to us at scienceandfooducla (at) gmail (dot) com and tell us about your best kitchen experiment. We’ll feature our favorite feats of kitchen science on the site! Preheat oven to 350 degrees. Cream butter and both sugars together until well mixed. Add eggs and mix for 2-3 minutes, until the batter is light in color. Add salt, vanilla, baking soda and mix. Add flour and chocolate chips together and mix until combined. Drop cookie batter by rounded tablespoon onto parchment paper or silpat lined baking sheets and bake for 10 minutes until lightly golden around edges but still soft in the center. About the author: Liz Roth-Johnson earned her Ph.D. in Molecular Biology at UCLA. If she’s not in the lab, you can usually find her experimenting in the kitchen. Tags: citizen science, cookies, cooking, experiment, kitchen, process of science, research, science, science fair, scientific method. Bookmark the permalink. My name is Chris. My daughters name is Maggie (9yrs old). Maggie is doing a science fair project that involves baking choc chip cookies 3 different ways. 1. w/room temp butter, 2. w/cold butter and 3. w/ melted butter. She wanted to see what the difference is and wants to understand why they are different. We’re having a hard time figuring out why. Do you have any words of wisdom to offer us? We would love to understand why the look of the cookies change with each different butter. Head over to our previous post on the science of cookies for an explanation. I hope that helps! One thing you might think about it how the different butter temperatures change how much the fat and water in butter can mix and mingle with the other ingredients. For instance, melted butter will be completely liquid, allowing all of the fat and water molecules to mix more evenly in the cookie dough. Cold butter, on the other hand, will likely mix less thoroughly, leaving tiny bits and pieces of butter chunks in the dough. So then how will this change things? While there’s no simple answer (cookie dough is really complex! ), you can try to think about how having more or less fat and water could change your cookie dough. For example, fat tends to inhibit gluten formation (the springy flour protein networks that give baked goods their chewiness) while water tends to promote gluten formation. Similarly, having chunks of butter in your dough can create small air pockets as the cookies bake, creating a flakier texture (think pie dough). If you haven’t already, check out Harold McGee’s book “On Food and Cooking” for a great introduction to food science. Good luck with your science fair project! My name is Remi. I am doing a science project on the effect of vodka in a pie crust. I wonder if you have any thoughts that could help me understand this better. I am also trying out recipes for my experiment, and hope to put it all together soon.